Browse: Home /	Bicycling, Events, LIVABLE STREETS, Transportation / Flatbush Bike Ride to Summer Streets! Okay, now I can speak from first-hand experience: Summer Streets, New York City’s experiment with creating a car-free haven for pedestrians and cyclists, is truly fantastic! 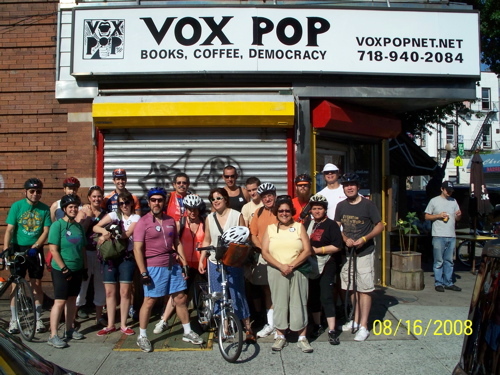 A group of us departed from Vox Pop Cafe in Flatbush to ride our bikes through Prospect Park and across the Brooklyn Bridge for this historic event. I must say I never thought I’d have the opportunity to cycle through Manhattan – with no fear of cars – from City Hall to 72nd Street; riding through the streets of Soho, around Union Square, under the Met-Life building and up Park Avenue to 72nd Street… it’s just a beautiful thing. Wow. I am so going to catch the last one of these this Saturday, thanks!!! Does anyone know if the city is planning to do this again for ’09? I participated last year and it was a truly amazing experience. Riding around the Grand Central overpass was like victory laps for the bicycle revolution! I certainly hope it happens again this year.